One of my favorite British comfort foods. This recipe is hearty, nourishing and caters to a paleo and ketogenic lifestyle. I love comfort food. Growing up I would walk home from school and although it wasn't a very long walk, it was very often chilly outside. I would race home because I knew that my mum would always have a warm and hearty dinner waiting for me on the table upon my return. One of my favorite family recipes? Cottage pie, also known as Shepherd's pie to many of you. It's essentially a large casserole of fluffy and creamy mashed potatoes served over juicy meat and an array of vegetables. It's the ultimate comfort food. I'm sure some of you are thinking that this sounds exactly the same as Shepherd's Pie. Surprisingly, there is in fact a difference between the two, and it lies in the choice of meat. 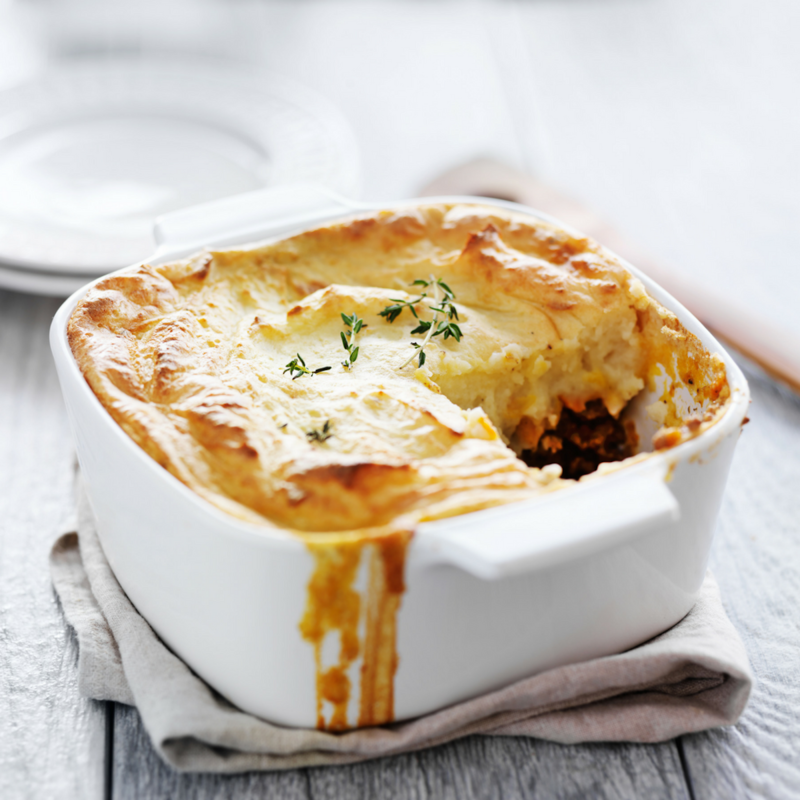 Shepherd's Pie is traditionally made from lamb, whereas Cottage Pie is made from ground beef. Other than that, they are both pretty much the same delicious, meaty dish we all adore in the UK. This recipe calls for grass-fed ground beef, so it's technically a cottage pie. Unlike the traditional recipe, it has a topping of mashed cauliflower. I wanted to make the dish lower in carbohydrates as I know many of you out there follow a Ketogenic diet and I personally love the taste of my cauliflower mash, so I subbed out the traditional potatoes. However, you can choose to use any starchy vegetable as the topping for this pie. We have made this with yellow potatoes, sweet potatoes, parsnip, and squash and they have all turned out fabulously. Enjoy this hearty British classic and be sure to let me know how you get on! 2) In a large saucepan, steam cauliflower florets until cooked through. 3) In a skillet, heat your cooking fat over medium heat. Add onion and carrots and saute until they start to soften. If you are choosing to add frozen vegetables, add them here. 4) Add grass-fed beef, garlic, tomato paste, parsley, salt and pepper to the skillet. Cook until meat has browned. 5) Transfer everything in the skillet to a 9x13 casserole dish and pat down. Set aside. 6) Drain cauliflower florets. In a food processor, add cauliflower, salt, pepper and one tablespoon grass-fed butter (optional). Blend until smooth and creamy. 7) Pour cauliflower mash over the meat in the casserole dish and smooth. If you are choosing to add grass-fed cheese, sprinkle on top of the cauliflower layer. 8) Bake for 25-30 minutes, or until piping hot. Serve and enjoy!